In any list of exotic pets (which can be found online and in print) there are tales of questionable veracity. Some are repetitions of unproven stories, some are provably false, and in other cases, the tales are true. 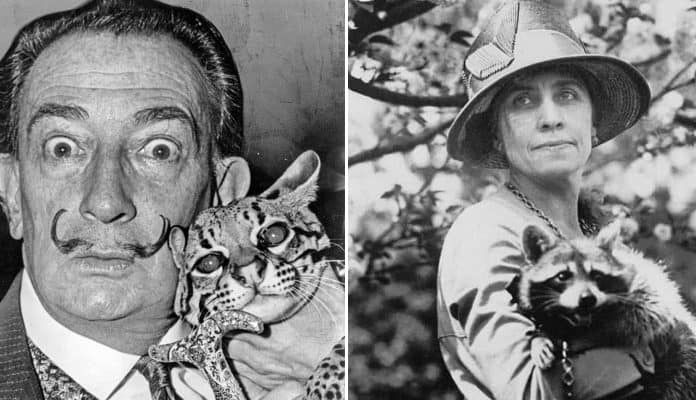 Exotic pets – some would substitute the word strange – have long been enjoyed by people of all walks of life, and for the famous have entered history as entertaining examples of their eccentricities. There is no question that some people have kept dangerous wild animals as pets, and some of the tales surrounding them have over the years been exaggerated out of proportion. An example of one such tale is the often repeated story of Thomas Jefferson keeping pet grizzly bears at his home at Monticello. On the face of it, the tale contains a smattering of truth. Jefferson did receive a pair of grizzly cubs as a gift from Zebulon Pike in 1807. The former president knew well of the ferocity of the American grizzly from the reports of Lewis and Clark. Jefferson immediately made arrangements to transfer the bears to Charles Wilson Peale’s museum in Philadelphia. Jefferson received the bears from Pike in October 1807; by January 1808 they were in Peale’s possession. Thus the story of Jefferson keeping grizzly bears as pets at Monticello is, at best, only partially true, though all too often repeated and embellished. Here are some stories of exotic pets in history and whether their assertions are supported by historical facts. Although there are varying versions of the tale, the gist of it is that Empress Josephine had a pet orangutan, which she dressed in children’s clothes. Her name was Rose, and she sat at table with Napoleon and Josephine, as well as slept in their bed – about which the Emperor complained. In truth, Josephine was called Rose by intimates (it was her birth name), and Napoleon did complain about a pet sharing their bed, but it was a pug dog. Several of Napoleon’s contemporaries left records of the Emperor’s feelings regarding his wife’s several dogs, as well as her penchant for excessive spending on exotic animals to roam the gardens of their home, Malmaison. Numerous exotic animals roamed the gardens of Malmaison, among one of the greatest rose gardens in the world then and now. But the story of Josephine’s pet orangutan has little factual support. Napoleon was often referred to in British propaganda as a gorilla, an ape, and in other denigrating terms, and it is likely the story arose out of the false accusations directed towards the Emperor, with the Empress taking an orangutan into her bed. Several of the exotic animals which were present at Malmaison were later donated to Parisian zoos and museums, and at least one orangutan was credited as being among them, but from the staff of servants and aides which crowded the Emperor’s house, which numbered in the hundreds, nothing exists to verify the tale of Empress Josephine’s strange treatment of an orangutan, or Napoleon’s tolerance of it.